Backstage Studio Tour: An Opening Day tram tour that originally loaded near the Magic of Disney Animation. It drove through Catastrophe Canyon and the New York and residential street. It also originally featured a walking portion and included the Bette Midler film The Lottery as well as a film called Michael and Mickey that ran from 1989 to 1992 before coming attraction trailers. This film was also shown during the ABC special The Best of Disney: 50 Years of Magic on 05/20/1991. 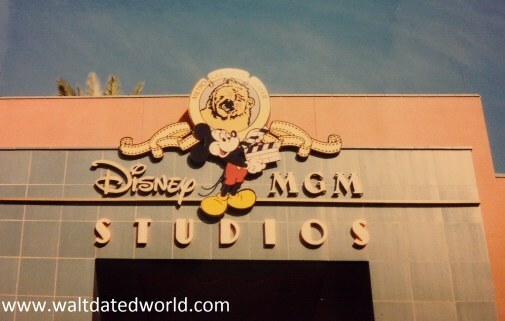 It became known as the Disney-MGM Studios Backlot Tour on June 30, 1996 and in January of 2008 the name was shortened to The Studio Backlot Tour. In 2009, live tour guides were eliminated and a pre-recorded spiel was used instead. The tour closed for good on September 27, 2014. Earffel Tower: A 130-foot tall water tower with mouse ears. It was removed in April of 2016 during construction for Toy Story Land. Honey, I Shrunk the Kids Movie Set Adventure: Playground open from December 17, 1990 to April 2, 2016. Oversize props such as a Kodak film slide and a giant ant made guests feel tiny. It was also known as the Honey, I Shunk the Kids Adventure Zone. The Magic of Disney Animation: Animation tour featuring the Robin Williams film Back to Neverland, a tour of the animation process and a peek at the artists (until 2003). It later featured the Animation Academy before closing on July 12, 2015 and become Star Wars Launch Bay December 1, 2015. Mickey's Audition: Film used during the summer of 1991 in one of the soundstages. It was later shown in the Main Street Cinema in 1994 and the Town Square Exhibition Hall as Mickey's Big Break. Roy E. Disney played Walt Disney in the film. Residential Street: This area featured the Golden Girls house and Herbie the Love Bug was parked in one of the driveways at one point. It was part of the Backstage Studio tram tour and the original site of the Osborne Family Spectacle of Lights until 2002. It was removed in 2003 for Lights, Motors, Action! Extreme Stunt Show. Streets of America: New name for New York Street starting in 2004. It closed on April 2, 2016.
Who Wants to Be a Millionaire-Play It! : Located in what is now Pixar Place, guests could participate in an interactive version of the TV game show and win prizes. It ran from April 7, 2001 to August 19, 2006 and later became the location of the Toy Story Midway Mania attraction. Disney's California Adventure also had a version of this show that ran from September 14, 2001 to August 20, 2004. A Conversation With... : A 1989 Disney Channel show with four separate episodes featuring George Burns, Carol Burnett, Bob Hope and Betty White answering questions from the audience. The Jungle Book Reunion: Syndicated special that aired on July 19, 1990. The Lottery: The film staring Bette Midler that was shown during the Backstage Studio Tour from May 1, 1989 to June 29, 1996. New Kids on the Block at Disney-MGM Studios-Wildest Dreams: This special aired on January 21, 1991 on ABC. Dave Smith's Disney A to Z book called the special New Kids on the Block at Walt Disney World-Wildest Dreams but it aired under the former name. Oscar: Sylvester Stallone film released April 26, 1991. Splash, Too: This made for TV movie was the very first thing filmed at the Studios on February 2, 1988. The Living Seas at Epcot was also utilized as a filming location. Back to Neverland: This animated film featured Robin Williams and was part of the Animation tour from opening day until September 30, 2003. John Henry: Animated short released October 30, 2000. Off His Rockers: An animated short film released July 17, 1992 that featured a plotline of a faithful rocking horse being overshadowed by video games. This theme was later revisited in the Toy Story films. Trail Mix-Up: A Roger Rabbit short.